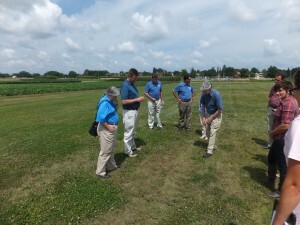 Scientists look at prairie junegrass evaluation plots on the campus at the University of Minnesota. Eric Watkins, Ph.D., turfgrass scientist at the University of Minnesota, shows a group of scientists his prairie junegrass evaluation plots on the campus at the University of Minnesota. Prairie junegrass is a perennial, cool-season grass native to much of the United States. Watkins believes prairie junegrass has the potential for use as a low maintenance turf species. So far, Watkins has collected and evaluated a number of prairie junegrass plants to determine their characteristics and potential as a turf species. His next step is to begin breeding the most promising plants to try to improve their turf qualities.